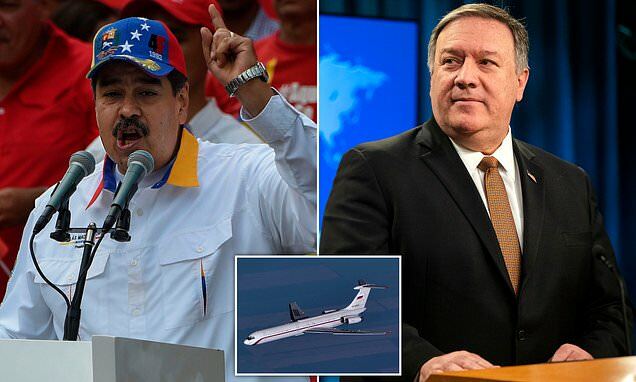 The United States on Monday accused Russia of worsening tensions over Venezuela through its military presence and warned that Washington will not 'stand idly'. It comes after two Russian air force planes landed at the South American country's main airport on Saturday carrying a defense official and nearly 100 troops, according to media reports. Secretary of State Mike Pompeo told Russian Foreign Minister Sergei Lavrov in a phone call that 'the United States and regional countries will not stand idly by as Russia exacerbates tensions in Venezuela,' the State Department said in a statement. Earlier this year the two nations held military exercises on Venezuelan soil that President Nicolas Maduro called a sign of strengthening relations, but which Washington criticized as Russian encroachment in the region.